Just got your degree? Congratulations! Now’s the time to follow that smart move with another, and take a few moments to learn how to build a good credit profile. Having good credit is important because it will save you money in the long run. Need to get a loan for a car or something else? You’ll get the best deal, in the form of lower interest rates, if your credit is good. You’ll also pay a lower interest rate on credit card debt. Your credit profile is also a big factor in how much you pay for car insurance—bigger even than your driving record, as a Consumer Reports study found. And if you don’t yet have a job, bad credit could cause a potential employer to think twice about hiring you. “Past-due accounts and judgments are examples of items that would appear as red flags during an employment credit check” in the many states that give employers the right to view your credit file as part of the hiring process, says Bruce McClary, vice president of the National Foundation for Credit Counseling, which represents not-for-profit credit counseling services and is based in Washington, D.C.
Building good credit, which you do primarily by paying back all sorts of bills in a timely way, in turn results in a higher credit score, a numerical representation of your creditworthiness. Credit scores typically range between 300 and 850—the higher the score, the lower the risk that you won’t pay back your debt. If you took out any student loans, you already have a credit score. Several companies create credit scores, but the FICO credit score is the one that most businesses use in their decision-making. Ask your bank whether it offers a free FICO score, or check out these other sources. Here’s how to make sure you start out on the right foot to build the best credit score possible. Many students start building their credit profiles while still in college by becoming authorized users of their parents’ credit cards. Or they obtain student credit cards with low spending limits. If they’re younger than 21, they must prove that they have adequate income independent of their parents to get a student card on their own. Credit card companies often start to send new offers to students after graduation. 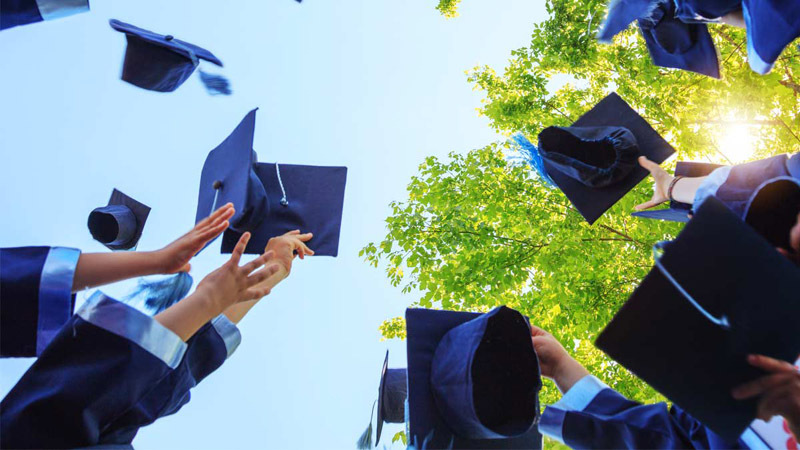 “In most cases lenders view graduates as attractive potential customers because of their postgraduation earning potential, among other factors,” McClary says. Your favorite retailers are another credit card source; often you’ll get an introductory discount on merchandise just for signing up. Wu says banks with which you have relationship also may accommodate your request for credit. “It may be a limited line of credit in the beginning,” she says. You can also pursue card offers on your own. Look for cards that charge competitive interest rates, have no annual fees, and offer cash back or other perks compatible with your lifestyle and spending patterns. “Your first card may have a relatively low credit limit, but this can increase on a yearly basis, provided you manage the card effectively,” says Janet Alvarez, a personal finance and credit card expert who writes for the website Wise Bread. Stay away from super-high-interest credit cards that serve the subprime credit market, says ChiChi Wu, staff attorney at the National Consumer Law Center, an advocacy group that focuses on credit and debt issues, and is based in Boston. Marketers of these cards target young people with thin credit histories, but the interest charged can be as high as 25 percent of the credit line—potentially higher than the balance. Some of these cards require an up-front fee before you can use them, Wu says. “A lot of people who get these types of cards end up hurting their credit, not helping it,” Wu says. Read the fine print on any card application. Lenders are required to provide information on interest rates, payment periods, fees, and other card features. You may find them on the lender’s terms and conditions page. Don’t spend close to the borrowing limit of your credit card, says Leslie Tayne, an attorney based in New York and author of “Life and Debt,” a personal finance self-help book. “If you do, depending on your provider, you may get stuck with a huge fee on top of your debt,” Tayne says. Try to keep your credit card use to no higher than 30 percent of your credit card limit to ensure that you stay in good credit standing, Tayne adds. In fact, she and others recommend limiting spending when you first start out. Make timely payments a priority; they’re crucial for developing a good credit score. You may have limited control over the size of your student debt or car-loan payment each month, but you can budget wisely to avoid overspending on your credit card, says Mike McGrath, vice president at EP Wealth Advisors, based in Valencia, Calif. Your first payment is by far the most important, says Alyssa Schaefer, chief marketing officer at Laurel Road, a student loan refinancing company. “Missing this first payment will make your FICO score drop dramatically and inhibit your ability to qualify for new credit or loans that can help you rebuild a better credit history,” she says. Pay off your credit card debt monthly—or at least bite off a big chunk of it. At the very least, try to pay debt down within two months. Successfully managing a few types of debt—student loans, auto loans, and credit cards, for instance—can help boost your credit score. Lenders like to see that you can handle a variety of debt types. But don’t take on loans just to create that balance. If you already have student loans, for instance, don’t go nuts on a costly car loan unless you can handle the payments. The nation’s three major credit reporting agencies—Equifax, Experian and TransUnion—collect data on every American’s credit usage. That data is what FICO and other companies use to create your credit score. It’s up to you, though, to make sure that the credit information that feeds your credit score is accurate. The Consumer Financial Protection Bureau has found that credit reports often contain significant mistakes—including mixing an individual’s credit history with that of someone else with the same name or a similar one. You can pay companies to regularly check your credit reports for errors, but there’s no reason to spend money that way. By law you’re entitled to a free credit report once a year from each of the three companies. Go to AnnualCreditReport.com and ask for a report from one of the companies; four months from now, ask for a report from a second of the companies, and eight months from now, ask for the third report. That way, you’ll be monitoring your own credit reports regularly without paying a third party to do it for you.